A year on from Gino’s first trip to Italy, a return to the country of his birth has seen Gino follow up this best seller with Gino’s Italian Escape – A Taste of the Sun! He travelled from Venice to Florence and from the coast of Liguria to the rolling hills of Tuscany and again set out to discover the tastes, flavours and cooking styles of his homeland. Gino’s Italian Escape – A Taste of the Sun contains a wealth of authentic Italian recipes. From delicious and hearty Italian soup recipes to pasta dishes old and new, the book is crammed full of inspirational ideas. There’s even a chapter for the sweet-toothed amongst you with some deliciously indulgent Italian dessert recipes for you to enjoy. This acclaimed recipe book is a mix of classic Italian recipes and Gino’s own creations – all of which are easy to cook, use minimal ingredients and have bags and bags of flavour. Gino’s Italian Escape – A Taste of the Sun will have you cooking like a real Italian in no time! 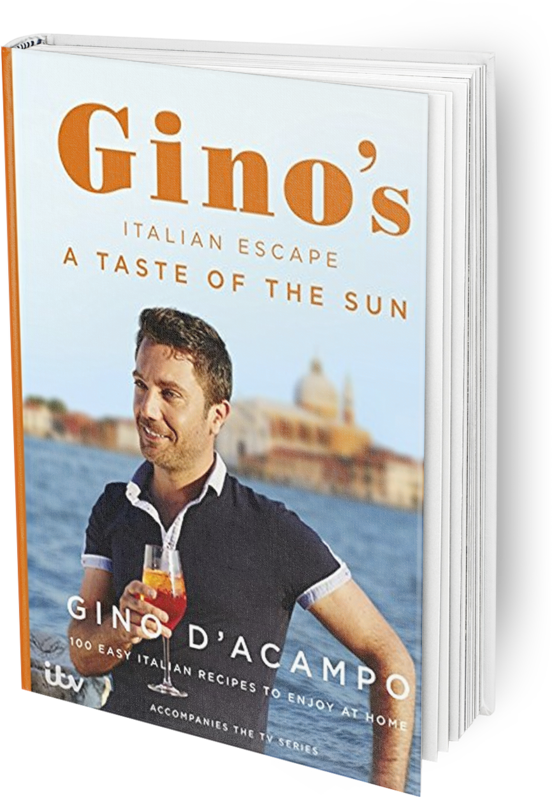 Click below to buy Gino’s Italian Escape – A Taste of the Sun or view recipes in Gino’s Italian Escape – A Taste of the Sun.